Understand how the enterprise interacts and delivers value, whilst building your business architecture in a way that ensures its ongoing development. iServer is here to help you develop and define the blueprint of your organization in line with your business strategy. iServer helps you to understand how the enterprise interacts and delivers value, as well as to build your business architecture in a way that ensures its ongoing development. We believe iServer is the best business architecture tool available and we base this belief on its exceptional capabilities. The iServer central repository acts as a storage point for all business architecture related projects within the organization. It is effectively a single source of truth. 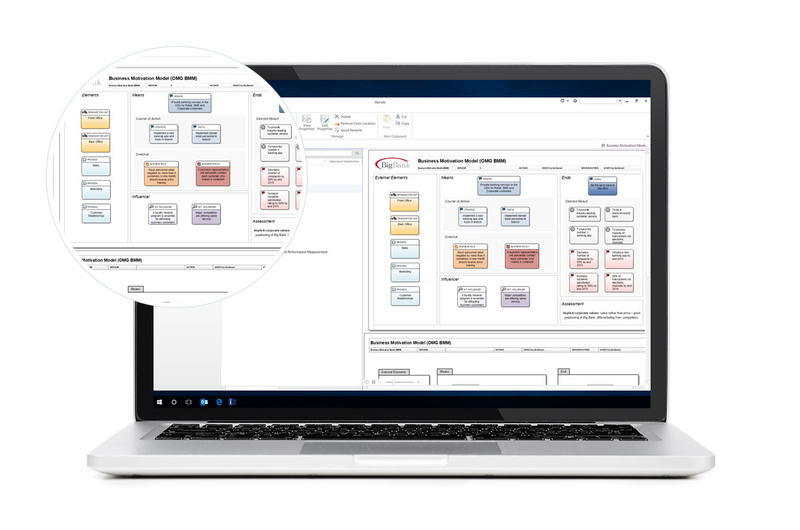 The repository structure can be implemented according to the TOGAF® repository structure, which enables architects to manage their deliverables, locate reusable assets, and publish outputs to stakeholders. In addition, iServer fully supports the TOGAF 9 Business Architecture meta-model, as well as other standards. iServer provides a core set of templates within the central repository to enable the ongoing development of the desired Business Architecture. 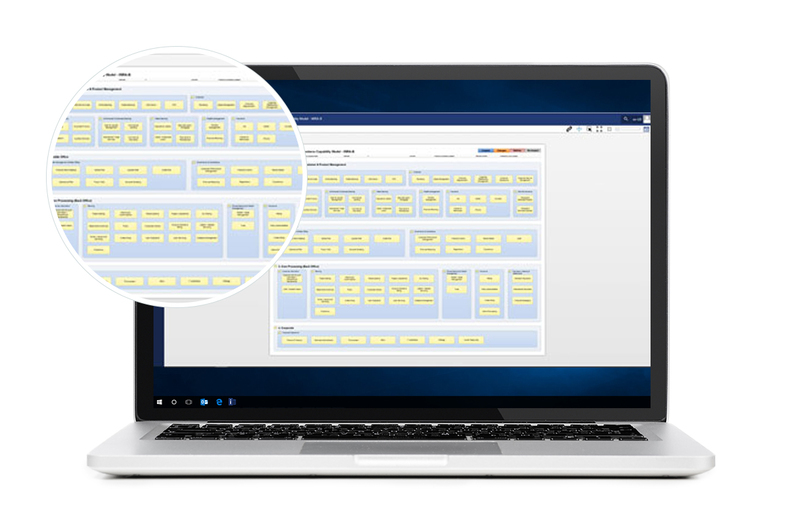 For instance, iServer features the Business Model Canvas, a widely accepted tool within the industry that provides a visual chart with elements to describe an organization’s business model building blocks. Additionally, iServer’s ‘Strategy-on-a-Page’ diagram showcases an organization’s strategy (drivers, goals, and objectives) aligned with identified core capabilities and initiatives. 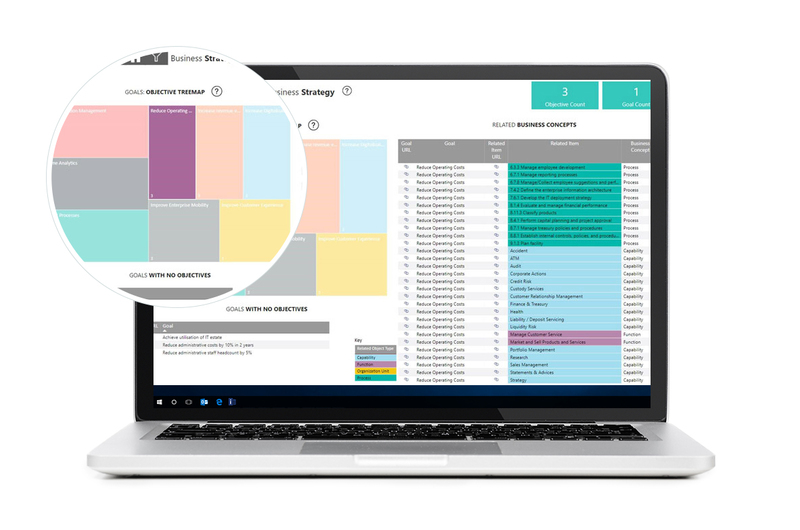 iServer’s Business Roadmap Initiatives template provides an attribute driven project roadmap where projects are grouped by programs and shows the linkage between capabilities to be delivered and the business strategy elements they fulfil. The Business Motivation Model (BMM) provides a scheme and structure for developing, communicating and managing business plans in an organized manner. It identifies factors that motivate the business plans, defines elements of the business plans and indicates their interrelationships. The Business Motivation Model in iServer offers users the capability to drill down into drivers, associated goals as well as their objectives in order to provide them with the most accurate image of the enterprise. Let’s face it, all the information in the world won’t help you if you can’t make sense of it. What’s more, in today’s complex business world where data is ever more readily accessible, it is becoming increasingly difficult to filter what is useful from what isn’t. Our answer to that problem is a powerful and reliable views and dashboards system that will cut through the noise, bringing you the valuable insights your organization needs to stay ahead of the competition. iServer features three types of Views: List, Hierarchy and Matrix. These allow users to navigate through content quickly and effectively. The dashboards available in iServer serve a similar purpose. They will help you instantly communicate large amounts of information to desired stakeholders, often by combining data from multiple areas of interest (e.g. Drivers, Goals, Objectives, Measures, Initiatives, etc.) in order to convey as comprehensive an image as possible. Lastly, add to all these capabilities iServer’s advanced searching and filtering system, and what you get is a platform for business architecture that will respond to your every requirement. Because we want to get you up and running as fast as possible, we can deliver iServer to you preconfigured with your framework of choice. 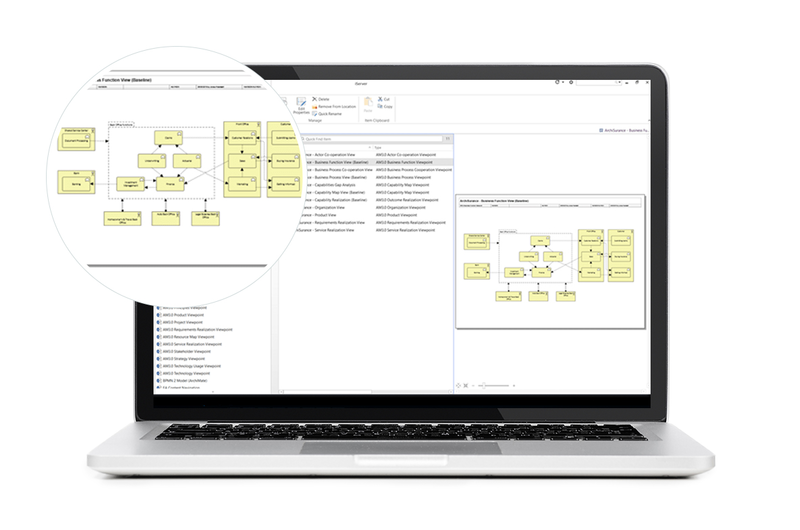 Let’s say you decided to use ArchiMate® for your business architecture practice. Within iServer you can find complete support for the ArchiMate 3.0 notation and meta-model, a complete set of ArchiMate viewpoints provided as Visio templates, ArchiMate diagram validation tool, an integrated TOGAF 9.1 and ArchiMate 3.0 repository when used in combination with TOGAF 9.1, the ArchiSurance case study from The Open Group, as well as resources including posters, user guides and white papers. 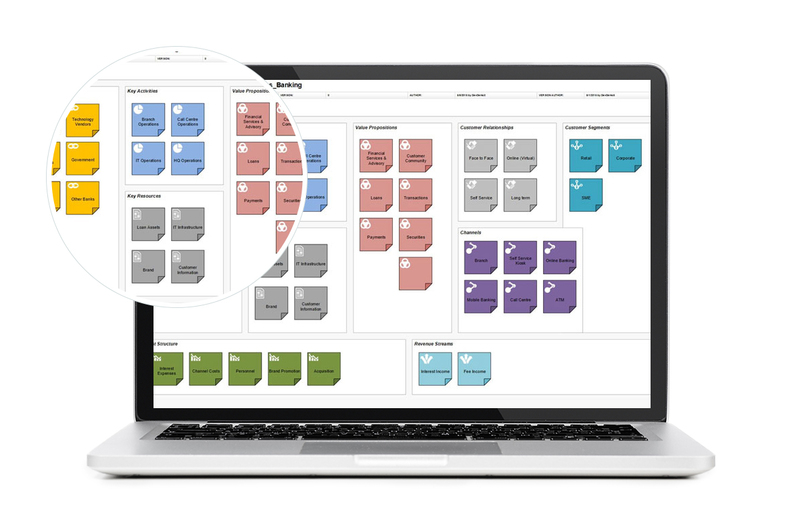 iServer also provides an environment for capability-based planning to help business architects understand and map the capabilities required to support the business strategy. The solution comes with a number of out of the box templates to help with this, including the Microsoft Industry Reference Architecture for Banking (MIRA-B), the Banking Industry Reference Network for Service Landscape (BIAN), and APQC’s Process Classification Frameworks (PCF’s). 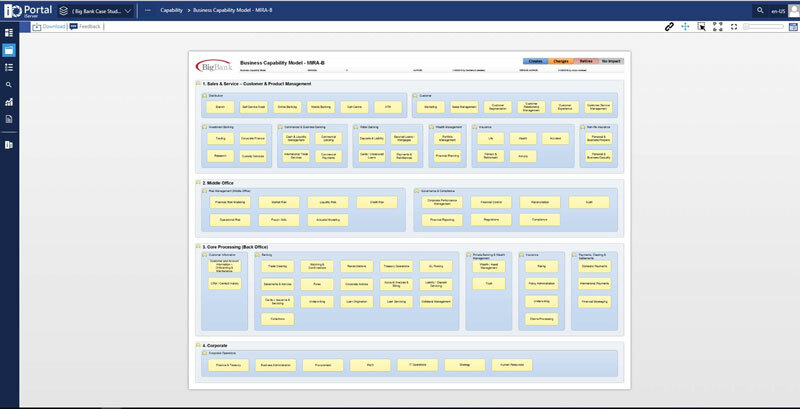 iServer also provides a ‘Capability-on-a-Page’ template, which can be used to show resources required for a given capability, such as people, process, and systems. Companies face a big challenge to enable their workforce to communicate effectively. Keeping all stakeholders informed, engaged and supportive of a project is critical especially when you consider how valuable feedback is. Therefore, it is imperative that content can be easily socialized with those that have an interest in the application business architecture. iServer's Communication Modules provide reporting, publishing and presentation capabilities that are which make it easy for users to share their repository with an unlimited number of stakeholders across the organization, enabling alignment with strategic goals and objectives, and supports better decision making.